Okay kids, no dunking, splashing or goose tipping! 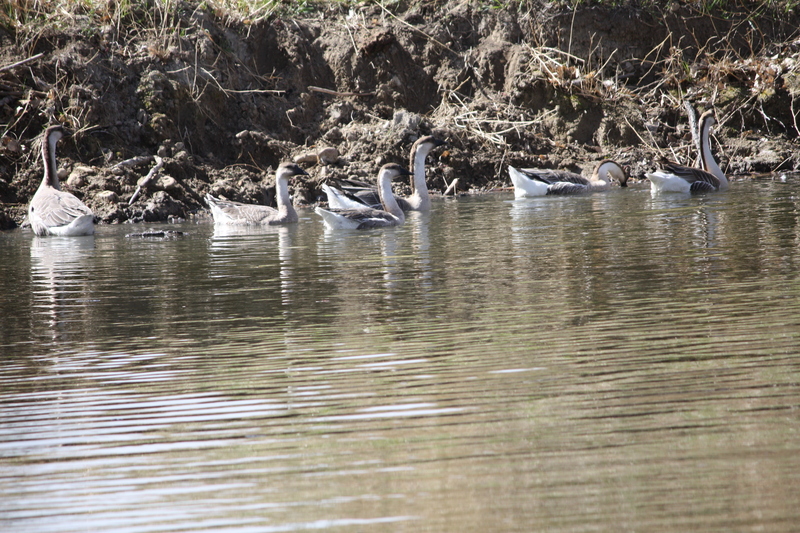 . . . .
Fred and Ethel finally took Ricky, Lucy, Esme and McGill to the pond for their first outing. Swimming lessons didn’t seem to be required, as they cautiously entered the water and floated for the first time. Before long, they were diving and paddling serenely across the pond as they were born to do. Each day thereafter, they have left at dawn and stay at the pond until evening, when they return for a ration of cracked corn and their wading pool. Ethel has been laying more eggs and trying to nest, but we are trying to discourage her. We have no room for more geese and now that her four babies are adults, they will be a challenge to house this winter! Perhaps we should advertise and see if there are homes for goslings in the realm, since Fred and Ethel have figured out how to be so prolific.